A much-loved children’s play centre has been completely ruined by a huge flood which recently hit Newtown when a water main burst. Shocking footage has been revealed from inside Burbury Park Children’s Centre after the event, showing staff walking through knee-deep water. 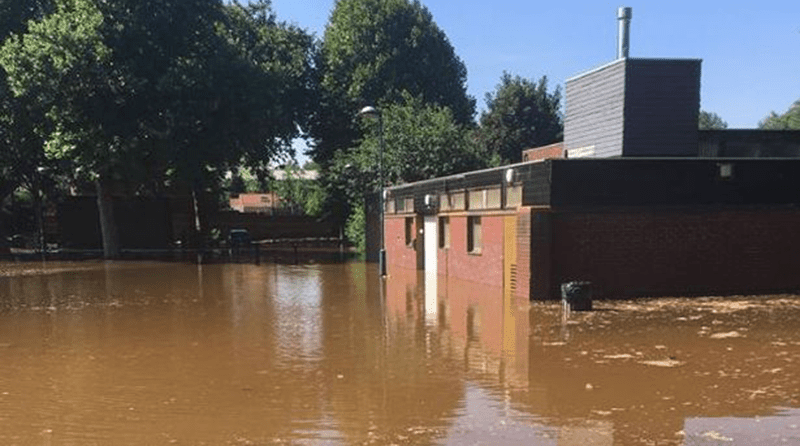 The disaster happened after a local pipe burst on Saturday 7th July, causing water to quickly submerge cars and homes before it reached the 44-year-old centre. Images show children’s coats still hanging on a coat rail just inches away from a flooded corridor. She added: “There was just one young lad going round on his bike trying to wake everyone up and warn them. “But there was no one stopping the traffic, so people were coming round the island and hitting a wall of water. “The speed of the water was ridiculous. “It hadn’t reached the park or Farm Street at this point. At 8am the park was bone dry. “But the next minute it was everywhere, pouring up and through the doors and we were knee-deep in it. The charity centre was soon completely ruined, leaving equipment and even the sensory room designed for children with disabilities unusable. Rachael said: “It’s wrecked everything, the offices, the playroom, the sensory room, everything. “With the heat, it smells already. All the sludge is in everything including the carpet. The charity has been open for 44 years but now faces having to replace everything they have lost before they can welcome back the children. Rachael added: “There’s 40 odd years’ worth of stuff and it’s all been wrecked. Around 500 childminders used to access the play centre before the flood, bringing children to socialise at the playgroup. The centre also offered training sessions and workshops for childcare staff. Rachael says they are planning to claim from Severn Trent for the damage caused, but as a charity they must also rely on “goodwill” and donations to rebuild what they had. If you can donate anything for the children or help in the clean-up process, then please call 07957914144.